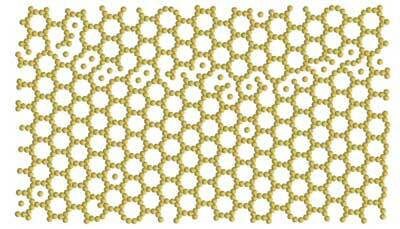 (Nanowerk News) Researchers at the University of Texas at Austin are exploring how molecular simulations with the latest optimization strategies can create a more systematic way of discovering new materials that exhibit specific, desired properties. More specifically, they did so by recasting the design goal to the microscopic, asking which interactions between constituent particles can cause them to spontaneously "self-assemble" into a bulk material with a particular property. To find the answer, reported this week in The Journal of Chemical Physics ("Probabilistic inverse design for self-assembling materials"), they decided to zero in on how composite particles spatially organize themselves. "Our technical inspiration came from a very different field of research -- the modeling and simulation of biomolecules," said Thomas Truskett, a professor in the McKetta Department of Chemical Engineering and co-author of the work. "Experts within that field had developed an array of tools for using molecular simulations to 'learn' which simplified-model interactions could reproduce the exquisite structural properties of large biomolecules." They recognized this modeling approach could be used to identify simpler interparticle interactions that would spontaneously self-assemble into the more complex structures. "Self-assembly is a phenomenon by which particles, such as atoms and molecules, spontaneously organize themselves into complex multidimensional architectures," said Truskett. "Freezing water -- crystallizing it -- is one everyday example, and the manner in which water molecules arrange themselves under prescribed external conditions is dictated by their interactions or forces." 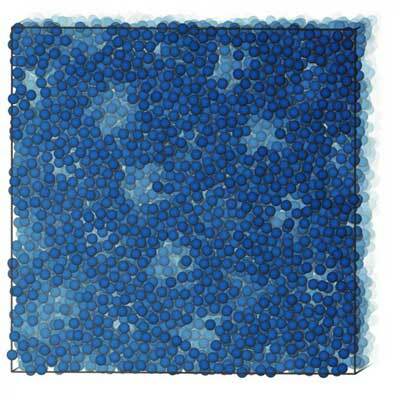 To expand the possibilities for self-assembly, the group investigated another class of particles called "colloids," which typically refer to larger molecules or nanoparticles suspended in a fluid. "[Colloids are] interesting for self-assembly and stand apart from their smaller atomic and molecular cousins because their interactions are highly tunable," said Ryan Jadrich, a postdoctoral fellow in the McKetta Department of Chemical Engineering. 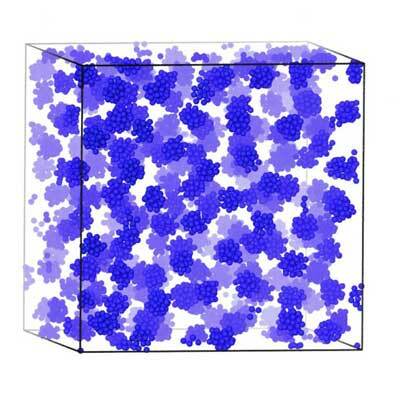 "By carefully tailoring colloidal particle interactions, we can exert unprecedented control over the microscopic organizational details to greatly influence bulk material properties." Forward design has been the de facto approach to engineering self-assembly for many years. "In a very simplified interpretation, forward design amounts to fabricating particles with novel interactions and then checking to see what they assemble into -- hopefully something desirable," Truskett said. "Researchers' physical intuition can help speed the process of realizing desired materials, but this approach is costly from a time perspective and requires some degree of luck or great expense." Inverse design, which the group's work addresses, quite literally attempts the problem in reverse. "Human researchers do what they're good at: envisioning novel and useful particle architectures. And computers do what they're good at: solving complex optimization problems," Jadrich said. According to Truskett, one of the main benefits of the new inverse design approach is that it provides a highly general framework that can be applied in targeting self-assembly of crystalline or fluid materials "on the fly." "[T]he method 'learns' everything it needs as the relevant data naturally emerges from an iterative, simulation-driven framework," he said. "An interesting corollary is that no precompiled auxiliary database of information is required -- such data repositories were an undesirable prerequisite for earlier crystal inverse design approaches." They computationally assembled some downright intriguing particle architectures, including one described as "Swiss cheese." "In this case, we discovered interactions that prompted particles to self-assemble into a matrix surrounding spherical holes, a.k.a. pores or cavities," Truskett said. "Remarkably, these pores ordered into a crystalline arrangement, while the smaller 'real' particles remained in a disordered, fluidic state percolating around the pores." Although inverse design is a relatively young and active area of research, headway is already being made toward a general and practically useful framework, according to Jadrich, where their work represents one emerging strategy. Inverse design is part of an emerging trend across scientific disciplines, using computational machine learning and statistical interference to accelerate discovery. "Inverse design enables the discovery of much more complex materials, on computers, than ever before, and this is a trend we believe will continue," he said. "Such tools won't soon replace human researchers, but allow researchers to focus on other, often more interesting tasks that demand creative design. The brunt of the work, which amounts to teasing out subtle details, finding patterns, or performing complex calculations, can now be relegated to automation."